The Workspace is your starting point in FlowJo. Figure 1. The FlowJo Workspace. 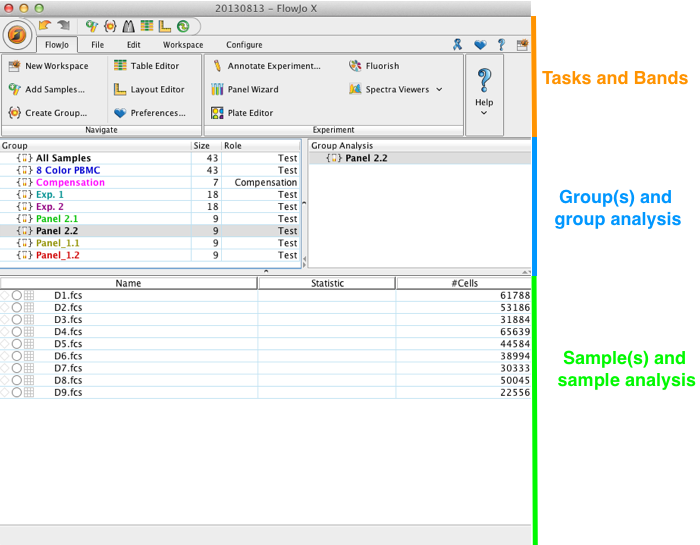 The workspace stores sample reference lists, sample analysis, supports the movement of analysis from sample-to-sample, sample-to-group or workspace-to-workspace and serves as a launch pad to other areas of the program such as the Graph Window , Table and Layout editors and all specialized analysis platforms. The default keyword used for the name can be changed in the preferences. The ALL samples and Compensation groups are displayed by default. The Compensation group can be deleted if you will not be creating a compensation matrix within FlowJo. The ALL samples group cannot be deleted. These are presented below each sample in a hierarchical scheme. Gates and statistics can be dropped on other samples or groups of samples. 4) All compensation matrices, either acquisition defined or FlowJo defined. A matrix “badge” is presented next to a sample if a compensation matrix has been applied. 5) Keywords associated with your data files. These can be added as additional columns in your workspace from the keywords already in your .fcs files or as new keywords tied to this workspace. 6) All table definitions that you create, which are present in the table editor. 7) All layout definitions that you create, which are present in the layout editor. Important: FlowJo workspace files do not store your data files (.fcs, .lmd, or .mqd files). Each time FlowJo runs, it accesses your data files and reads them into the workspace. This means that moving data files can cause a situation where FlowJo will need to be re-associated with them. To avoid this, we highly recommend storing your data files in the same folder where your workspace is stored. To read more about this, go here. To learn about the various components of the workspace, please see the subpages of the Workspace page here.